Attention Ladybird fans! 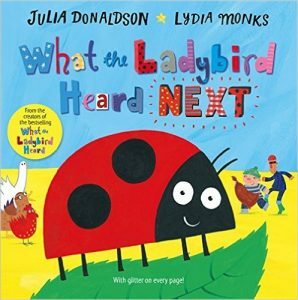 Julia Donaldson’s latest book continues the farmyard adventures of the brave and enterprising little ladybird, as she hatches a cunning plan to prevent Lanky Len and Hefty Hugh from making off with the farmer’s prize hen. For a chance to buy your copy and get it signed by Julia Donaldson, come down to the bookshop on FRIDAY 18th SEPTEMBER from 4 – 5.30 pm. Then from 6 pm we invite our customers to celebrate the successful link-up of our bookshop website with Julia’s website – it all seems to be working wonderfully, so do come and join us for wine, nibbles and a chat with Julia and Malcolm.